It's the Summer of 1864 and things are not going well for the Confederate States of America. But Major-General Sterling Price, former Governor and Mexican War hero, has a daring plan to invade his home state of Missouri and capture it for the Confederacy. With 12,000 cavalry, Major-General Price enters Missouri in the Fall of 1864, intent on capturing the state's largest city, Saint Louis. Many of the invading Confederates are Missourians intent on gaining control of their home state. Missouri is ripe for the taking. Although Missouri has been plagued constantly by guerrilla warfare, Federal authorities have continued to pull Federal forces out of Missouri to fight in other places. What few forces remain are scattered throughout the state. Major-General William S. Rosecrans is the Federal commander in Missouri and the Confederate invasion has him scrambling to mount a defense. Rosecrans orders Brigadier-General Thomas Ewing, Jr. to take command of a detachment of 1,200 Federal cavalry and infantry, along with a battery of field artillery. General Ewing assumes command of the detachment in Pilot Knob, a small town in southeastern Missouri. Here the Federals will occupy the earthworks of Fort Davidson to stand between the invading Confederates and Saint Louis. 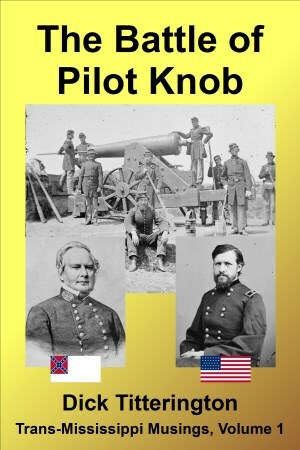 This book is a combination of narrative and eye-witness accounts that tell the story of what happened when 12,000 Confederates went up against 1,200 Federals in the Battle of Pilot Knob.